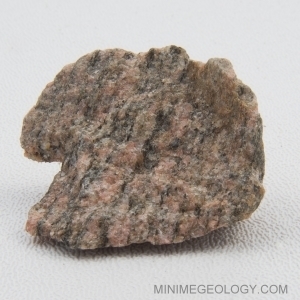 Gneiss is a light gray, black, white, and sometimes pink banded metamorphic rock. The bands form from the heating and squeezing of the original parent rock. Gneiss is pronounced “nice.” The original rock type is typically a granite, arkose, siltstone or sandstone. Gneiss has a medium to coarse-grained texture.